Now you see it, now you don’t! 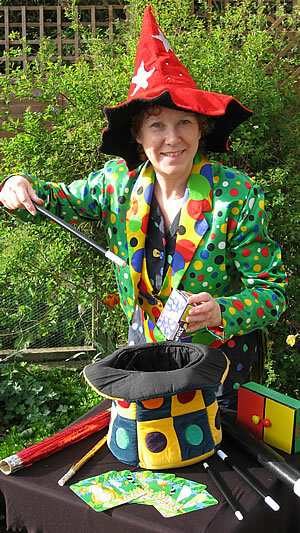 The props are colourful and the magic is aimed at children from three to sevenyears old, with a mixture of slapstick, quick tricks and little stories incorporating magic. Most wonderful of all, the children themselves take hold of the wands and make the magic happen. Alas, Jenny-Any-dots seems to get everything wrong, with floppy magic wands and disappearing handkerchiefs. She really needs help, so it is just as well there are able assistants on hand, and everyone knows that on their birthdays children are extra-specially magic, so the birthday child is always singled out to help. But perhaps the real magic is the wonder, joy and laughter on the faces of the children taking part.